This article is about the astronomical constellation. For the astrological sign, see Capricorn (astrology). Capricornus /ˌkæprɪˈkɔːrnəs/ is one of the constellations of the zodiac. Its name is Latin for "horned goat" or "goat horn" or "having horns like a goat's", and it is commonly represented in the form of a sea-goat: a mythical creature that is half goat, half fish. Its symbol is (Unicode ♑). Visible at latitudes between +60° and −90°. Capricornus is one of the 88 modern constellations, and was also one of the 48 constellations listed by the 2nd century astronomer Ptolemy. Under its modern boundaries it is bordered by Aquila, Sagittarius, Microscopium, Piscis Austrinus, and Aquarius. The constellation is located in an area of sky called the Sea or the Water, consisting of many water-related constellations such as Aquarius, Pisces and Eridanus. It is the smallest constellation in the zodiac. The constellation Capricornus as it can be seen with the naked eye. The globular cluster Messier 30 imaged by the Hubble Space Telescope. 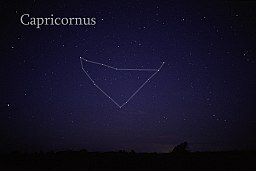 Capricornus is a faint constellation, with only one star above magnitude 3; its alpha star has a magnitude of only 3.6. The brightest star in Capricornus is δ Capricorni, also called Deneb Algedi, with a magnitude of 2.9, 39 light-years from Earth. Like several other stars such as Denebola and Deneb, it is named for the Arabic word for "tail" (deneb); its traditional name means "the tail of the goat". Deneb Algedi is a Beta Lyrae variable star (a type of eclipsing binary). It ranges by about 0.2 magnitudes with a period of 24.5 hours. The other bright stars in Capricornus range in magnitude from 3.1 to 5.1. α Capricorni is a multiple star also known as Algedi or Giedi. The primary (α2 Cap), 109 light-years from Earth, is a yellow-hued giant star of magnitude 3.6.; the secondary (α1 Cap), 690 light-years from Earth, is a yellow-hued supergiant star of magnitude 4.3. The two stars are distinguishable by the naked eye, and both are themselves multiple stars. α1 Capricorni is accompanied by a star of magnitude 9.2; α2 Capricornus is accompanied by a star of magnitude 11.0; this faint star is itself a binary star with two components of magnitude 11. The traditional names of α Capricorni come from the Arabic word for "the kid", which references the constellation's mythology. β Capricorni is a double star also known as Dabih. It is a yellow-hued giant star of magnitude 3.1, 340 light-years from Earth. The secondary is a blue-white hued star of magnitude 6.1. The two stars are distinguishable in binoculars. β Capricorni's traditional name comes from the Arabic phrase for "the lucky stars of the slaughterer," a reference to ritual sacrifices performed by ancient Arabs at the heliacal rising of Capricornus. Another star visible to the naked eye is γ Capricorni, sometimes called Nashira ("bringing good tidings"); it is a white-hued giant star of magnitude 3.7, 139 light-years from Earth. π Capricorni is a double star with a blue-white hued primary of magnitude 5.1 and a white-hued secondary of magnitude 8.3. It is 670 light-years from Earth and the components are distinguishable in a small telescope. Several galaxies and star clusters are contained within Capricornus. Messier 30 is a globular cluster located 1 degree south of the galaxy group NGC 7103. The constellation also harbors the wide spiral galaxy NGC 6907. 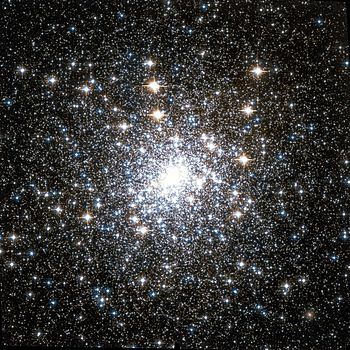 M30 (NGC 7099) is a centrally-condensed globular cluster of magnitude 7.5. At a distance of 30,000 light-years, it has chains of stars extending to the north that are resolvable in small amateur telescopes. One galaxy group located in Capricornus is HCG 87, a group of at least three galaxies located 400 million light-years from Earth (redshift 0.0296). It contains a large elliptical galaxy, a face-on spiral galaxy, and an edge-on spiral galaxy. The face-on spiral galaxy is experiencing abnormally high rates of star formation, indicating that it is interacting with one or both members of the group. Furthermore, the large elliptical galaxy and the edge-on spiral galaxy, both of which have active nuclei, are connected by a stream of stars and dust, indicating that they too are interacting. Astronomers predict that the three galaxies may merge millions of years in the future to form a giant elliptical galaxy. Despite its faintness, Capricornus has one of the oldest mythological associations, having been consistently represented as a hybrid of a goat and a fish since the Middle Bronze Age. First attested in depictions on a cylinder-seal from around the 21st century BC, it was explicitly recorded in the Babylonian star catalogues as MULSUḪUR.MAŠ "The Goat-Fish" before 1000 BC. The constellation was a symbol of the god Ea and in the Early Bronze Age marked the winter solstice. In Greek mythology, the constellation is sometimes identified as Amalthea, the goat that suckled the infant Zeus after his mother, Rhea, saved him from being devoured by his father, Cronos. The goat's broken horn was transformed into the cornucopia or horn of plenty. According to some ancient Greek myths, it started with the sea-goat Pricus. he was the father of the race of sea-goats (half goats half fish), who were intelligent and honourable creatures. They lived in the sea near the shore. They could speak and think according to Greek legend. They were favoured by the gods. Pricus is tied to Chronos (Greek mythology), the god of time. Chronos created the immortal Pricus, who shares Chronos's ability to manipulate time. He had lots of children who lived near the seashore, however, when they found themselves on the dry land they turned into normal goats, losing their special ability to think and speak in the process. In an effort to prevent this, Pricus turns back time, again and again; however, he eventually resigns himself to loneliness and misery, letting the little Sea Goats leave him. Learning he cannot control their fate and not wanting to be the only Sea Goat prompts him to ask Chronos to let him die. Because he is immortal instead, he must spend eternity in the sky as Capricorn. Capricornus is also sometimes identified as Pan, the god with a goat's head, who saved himself from the monster Typhon by giving himself a fish's tail and diving into a river. Due to the precession of the equinoxes, the December solstice no longer takes place while the sun is in the constellation Capricornus, as it did until 130 BCE, but the astrological sign called Capricorn begins with the solstice. The solstice now takes place when the Sun is in the constellation (not the sign) of Sagittarius. The sun's most southerly position, which is attained at the northern hemisphere's winter solstice, is now called the Tropic of Capricorn, a term which also applies to the line on the Earth at which the sun is directly overhead at noon on that solstice. The Sun is now in Capricorn from late January through mid-February. The planet Neptune was discovered by German astronomer Johann Galle, near Deneb Algedi (δ Capricorni) on September 23, 1846, which is appropriate as Capricornus can be seen best from Europe at 4:00am in September (although, by modern constellation boundaries established in the early 20th Century, Neptune lay within the confines of Aquarius at the time of its discovery). Capricornus as a sea-goat from Urania's Mirror (1825). 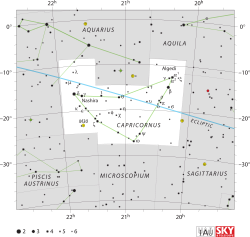 Capricornus's brighter stars are found on a triangle whose vertices are α2 Capricorni (Giedi), δ Capricorni (Deneb Algiedi), and ω Capricorni. Ptolemy's method of connecting the stars of Capricornus has been influential. Capricornus is usually drawn as a goat with the tail of a fish. Diagram of H.A. Rey's alternative way to connect the stars of the Capricornus constellation. H. A. Rey has suggested an alternative visualization, which graphically shows a goat. The goat's head is formed by the triangle of stars ι Cap, θ Cap, and ζ Cap. The goat's horn sticks out with stars γ Cap and δ Cap. Star δ Cap, at the tip of the horn, is of the third magnitude. The goat's tail consists of stars β Cap and α2 Cap: star β Cap being of the third magnitude. The goat's hind foot consists of stars ψ Cap and ω Cap. Both of these stars are of the fourth magnitude. In Chinese astronomy, constellation Capricornus lies in The Black Tortoise of the North (北方玄武, Běi Fāng Xuán Wǔ). The Nakh peoples called this constellation Roofing Towers (Chechen: Neģara Bjovnaš). In the Society Islands, the figure of Capricornus was called Rua-o-Mere, "Cavern of parental yearnings". ^ a b "Camelopardalis, constellation boundary". The Constellations. International Astronomical Union. Retrieved 14 February 2014. ^ "Capricornus, the Goat – Constellations – Digital Images of the Sky". Allthesky.com. Retrieved 2012-05-16. ^ a b c d e f g Ridpath & Tirion 2001, pp. 102–103. ^ Mark R. Chartrand III (1983) Skyguide: A Field Guide for Amateur Astronomers, p. 126 (ISBN 0-307-13667-1). ^ Rogers,, John H. (1998). "Origins of the ancient constellations: I. The Mesopotamian traditions". Journal of the British Astronomical Association. 108: 9–28. Bibcode:1998JBAA..108....9R. ^ Delahunty, Andrew; Dignen, Sheila (2012). Oxford Dictionary of Reference and Allusion (3rd ed.). Oxford University Press. p. 91. ISBN 978-0-19-956746-1. ^ "Capricornus". Jebrown.us. Retrieved 2012-05-16. ^ Makemson 1941, p. 251. 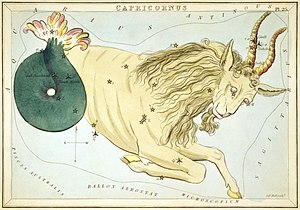 Wikimedia Commons has media related to Capricornus.